On Wednesday, Oct. 17, the School bus Arm Camera Legislation, Senate Bill 1098, was signed by the General Assembly and was sent to the governor’s desk for his signature. Senate Bill 1098, would allow for school buses to have a camera installed on its stop arm to aid in catching these careless drivers who illegally pass school buses dropping off their students. It is becoming more and more common that drivers fail to stop when school buses put out their stop sign and stop arm while picking up or dropping off students, which is illegal. This is causing much fear and concern for school bus drivers and parents as children’s safety is in jeopardy. Some school districts in Pennsylvania are already using this technology. This legislation would encourage more school districts to take advantage of this technology, which would increase the enforcement of state law, which relates to meeting or overtaking a school bus – duty of approaching driver when red signals are flashing. We need to continue to fight for our children’s safety and this legislation is an additional tool in this concern. Senate Bill 1098 passed the House 180-1 and the Senate unanimously. 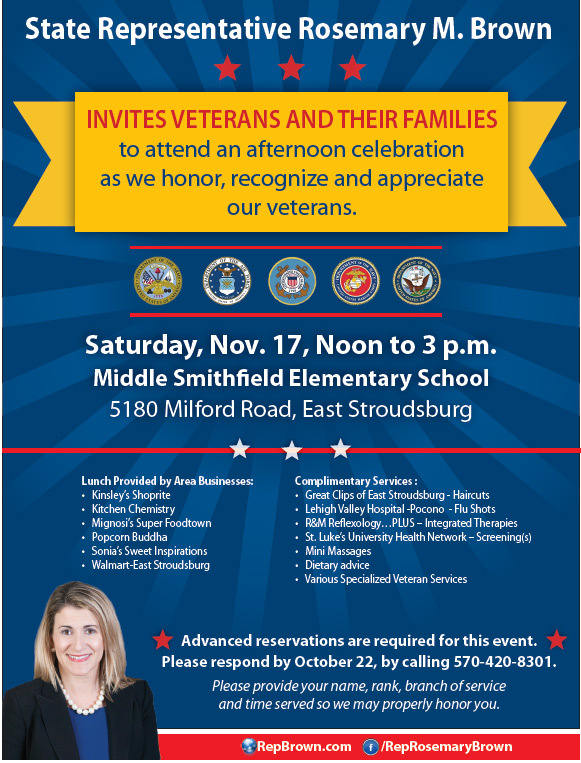 On Saturday, Nov. 17, I will be hosting our annual veteran celebration at the Middle Smithfield Elementary School, 5180 Milford Road, East Stroudsburg, from noon to 3 p.m. I want to invite all area veterans and their families to attend this celebration as we honor, recognize and appreciate not only them, but all who answered the call to serve this great nation. Lunch will be provided, and complimentary services will be offered to those who attend. Advanced reservations are required for this event. When registering with my district office, 570-420-8301, please provide your name, rank, branch of service and time served so we may properly honor you. Registration deadline for this event is Monday, Oct. 22. 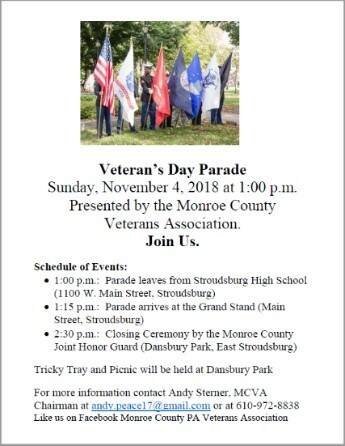 On Nov. 4, at 1 p.m., the Monroe County Veterans Association will be hosting a Veterans Parade that will begin at Stroudsburg High School and end at Dansbury Park in East Stroudsburg. At 2:30 p.m. at the park, the Monroe County Joint Honor Guard will hold closing ceremonies including a picnic and tricky tray fundraiser. If any local groups or organization would like to participate in the parade this year, click here for the application and parade rules/fees. Applications and fees should be submitted to the Monroe County Veterans Association no later than Monday, Oct. 22. For more information contact Andy Sterner, MCVA chairman, at andy.peace17@gmail.com or at 610-972-8838. 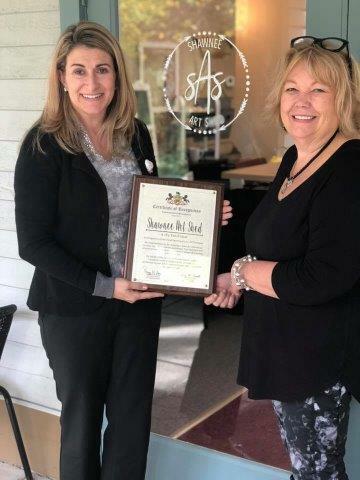 I helped celebrate an exquisite new business this past weekend, Shawnee Art Shed (a DIY boutique), at its grand opening with owner, Anne Seagraves. (It is located off Buttermilk Falls Road, Shawnee on Delaware). It contains a beautiful, inspiring studio space with classes and events to satisfy the artist in everyone. Thank you, Anne, for choosing Monroe County for your business! I’m looking forward to enjoying a few classes in the future! Last Friday evening, I helped recognize the quality and affordable education that Northampton Community College-Monroe Campus has offered for 30 years in our community. 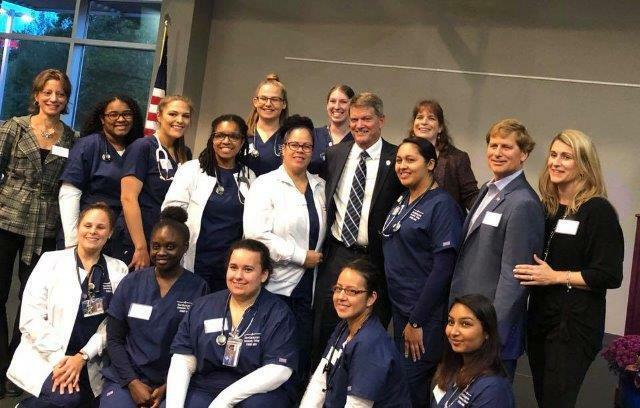 Private donors were especially thanked for their support which has helped build and enhance programming, including its new nursing program with amazing labs while keeping tuition affordable. Many of these wonderful nursing students are shown above. 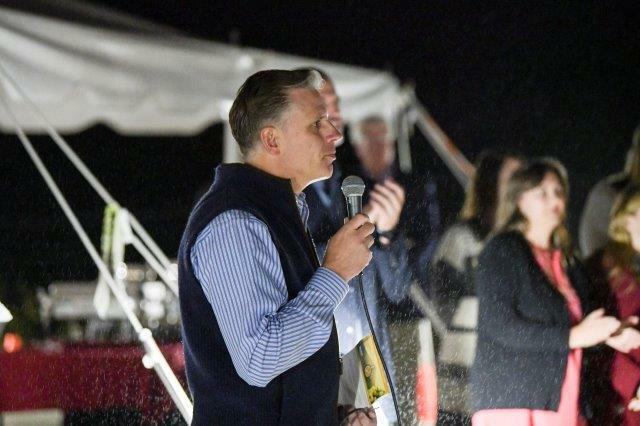 I joined the team from Animal Welfare Society of Monroe (AWSOM) last Saturday as it hosted its fundraiser at Pocono Brewery Company. This fundraiser helps to support AWSOM that cares for abandoned animals and works to find them a forever home along with offering medical care for animals in its clinic. Many volunteer positions are available at AWSOM and it is always looking to introduce some of its animals to new owners! 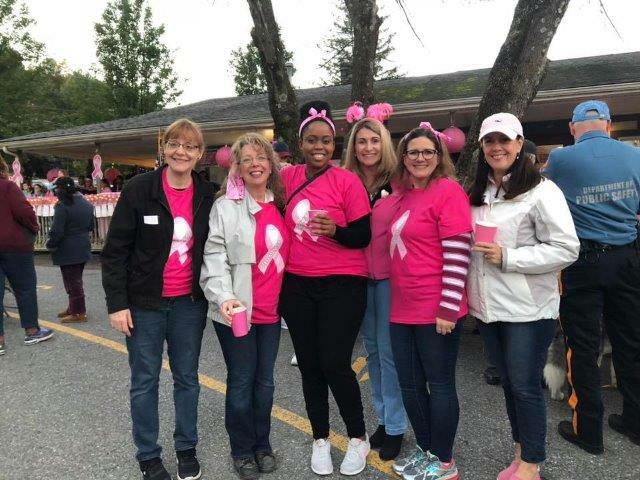 Another heartfelt Pink Light Walk was organized by Saw Creek Estates and the many dedicated volunteers Saturday evening. Thank you to the Lehman Middle School Choir for always singing, and all those who purchased food and made donations, which will go to our local cancer center. Remember to urge the women in your life to have a 3D mammogram which offers even more detailed testing. For those who may have income eligibility, the Department of Health offers the Healthy Woman program which gives women free mammograms and cervical cancer screenings. Please call my office if you may need additional information. Great job Saw Creek in supporting your neighbors and our cancer center- thank you! PA Department of Health will be hosting a Free Narcan Training class next month at Stroudsburg Wesleyan Church. The training will take place on Saturday, Nov. 3 at 10 a.m. Participants will learn how to spot and respond to an overdose. Pre-registration is welcome but not required. Please call or text 570-972-7217. 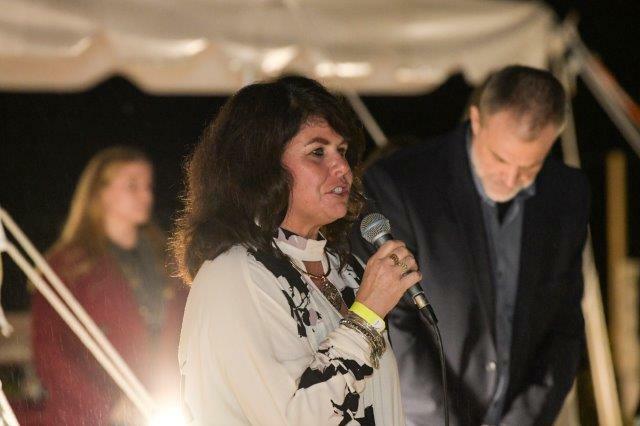 On Saturday, Oct. 6, I attended St. Luke’s Hospital’s annual Corks n’ Forks fundraiser. 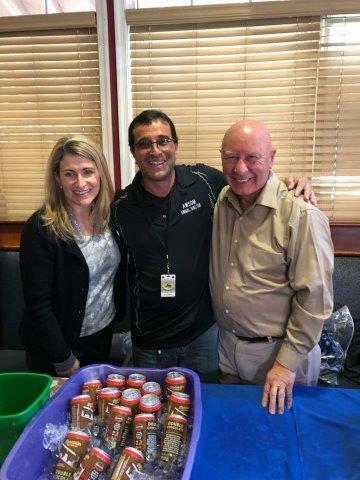 At the event, Don Seiple, President of St. Luke’s Monroe Campus and Pocono Mountain School District Superintendent; and Dr. Elizabeth Robison, spoke about St. Luke’s bringing their School Vision Program to Clear Run Elementary and Pocono Mountain Intermediate schools. This is just the beginning of this partnership. The program has two parts: A vision voucher, good for an exam and glasses if needed and a vision shuttle, and transportation to the eye doctor if needed. St. Luke’s and the district are working together to ensure that students in need get the glasses they require to help them succeed inside the classroom. The program’s initial goal is to provide 260 students with severe vision issues and financial need with glasses! Pike County Conservation District is accepting applications for a full-time Watershed Specialist. The District is seeking a motivated, organized individual who is able to manage multiple projects and has a keen interest, experience and educational background in water or natural resource management to coordinate and manage the District’s water resource program including in-field monitoring and community outreach. Send cover letter and resume to Executive Director, 556 Route 402, Hawley, PA, 18428 or email mlong@pikepa.org by November 7, 2018. Pike County is an EOE. Other jobs are open and available here in the Commonwealth. If you are searching for employment here in Pennsylvania, you can visit this website. Currently, more than 8000 Pennsylvanians are waiting for an organ transplant. A new law – Act 79 of 2018 – passed the House and Senate this fall to better protect victims of domestic violence by strengthening the requirements for firearm relinquishment in cases of final Protection from Abuse (PFA) orders or convictions of crimes of domestic violence.